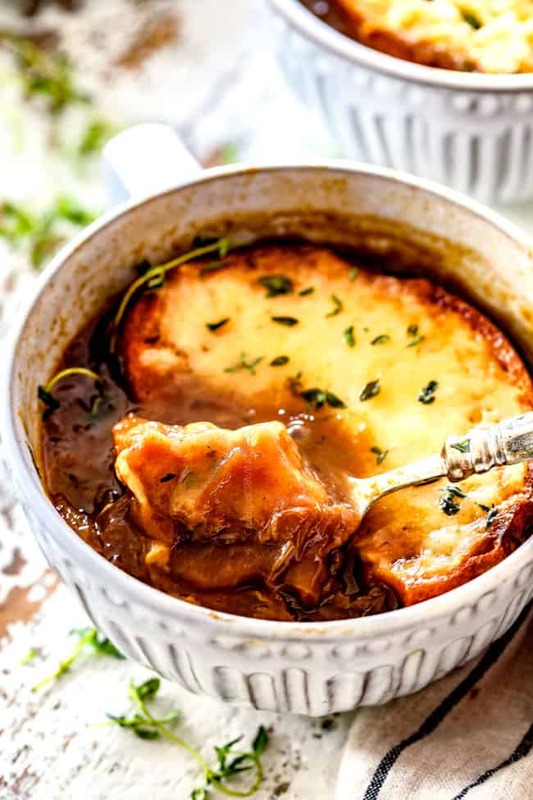 Classic French Onion Soup to rival any restaurant! 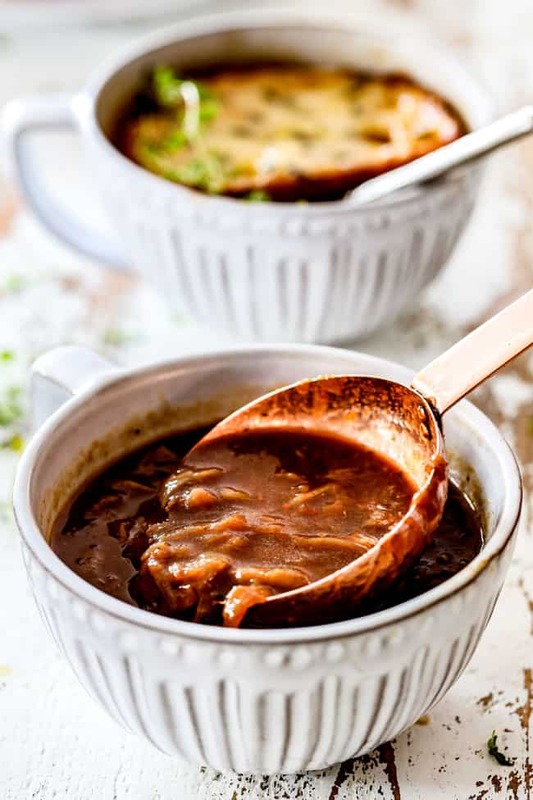 French Onion Soup is easier than you think to make at home so you can cuddle up with a big bowl of hot, herby beef broth loaded with deeply flavorful caramelized onions and ooey gooey Gruyere croutons any night of the week! 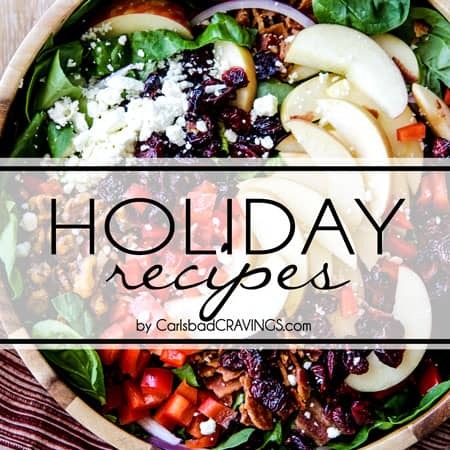 I’ve included detailed instructions, tips for perfect caramelized onions, how to make French Onion Soup without oven safe bowls, how to make ahead and how to freeze! As a cold front from the polar vortex sweeps through the Midwest and the rest of us bundle up to less extreme temperatures, I thought it was time to get cozy with French Onion Soup! 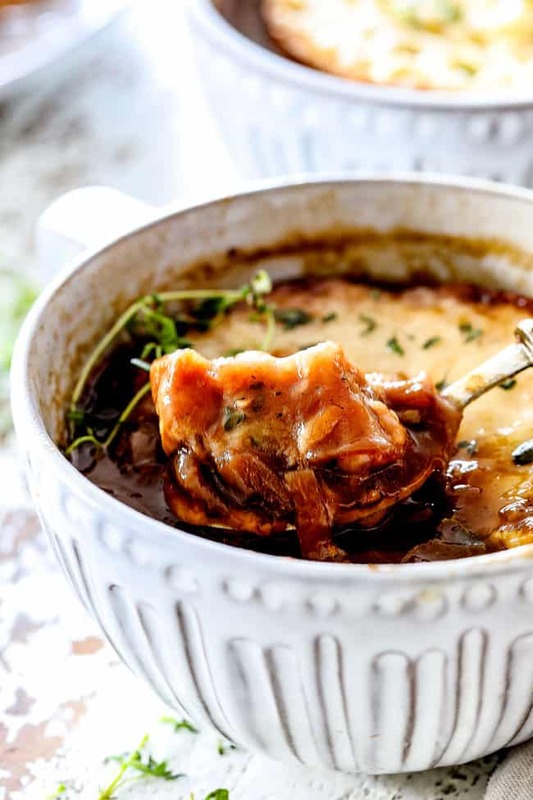 Just the name “French Onion Soup” blankets me in warmth – and has me drooling. 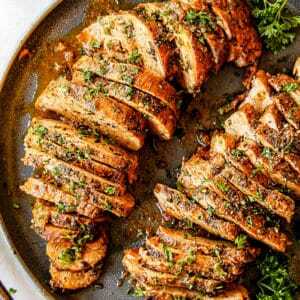 It is about as comforting as it gets right along with Beef Stroganoff and Lasagna, and would also be a tasty addition to your Valentine’s Day menu because it is special occasion fabulous. If you’ve never made classic French Onion Soup before, please don’t be intimidated! It is simple to make with a few pantry ingredients but it does take some time – but not skill. Good thing is, the time isn’t labor intensive – you just have to know how to stir! Caramelizing the onions takes a solid 40 minutes, stirring frequently. You don’t have to babysit them like risotto, you can come and go and stir in between other tasks. Or just pull up a chair and put your favorite show on. 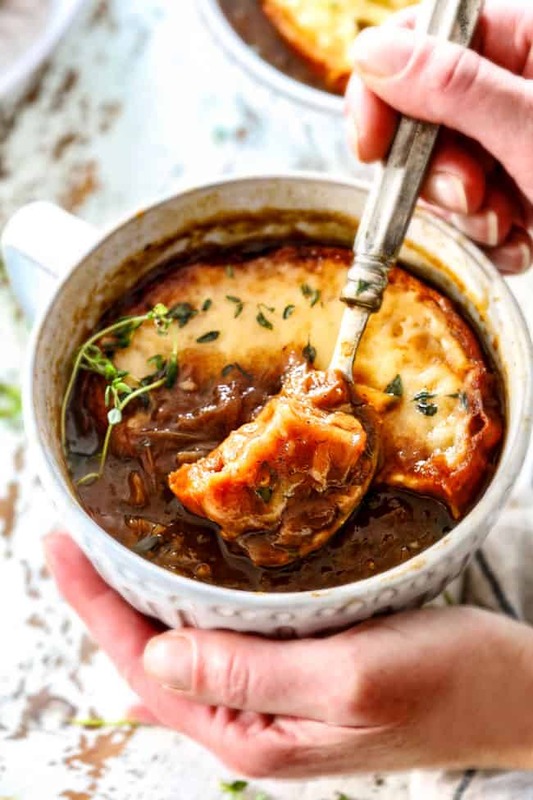 Time passes either way, so you might as well get an epic homemade French Onion Soup out of it! At the end of 40-50 minutes, you will be AMAZED at the caramelization of your onions. It is magic. They transform from raw, pungent onions to gloriously sweet, deeply golden, tender slices of heaven. 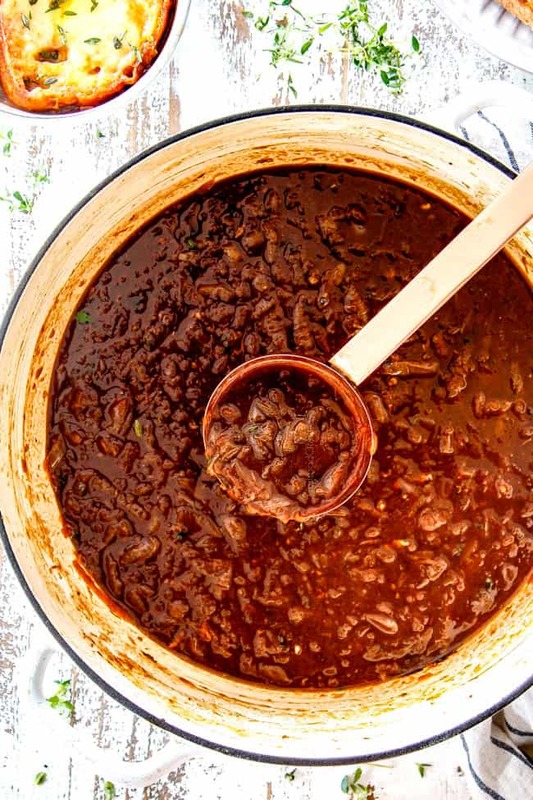 These caramelized onions are the star of our easy French Onion Soup recipe bursting with intensely sweet caramelized flavor that becomes exponentially more delicious with cheesy bread that soaks up the rich onion broth for slurp after slurp of hot cheesy, sweet and savory deliciousness. 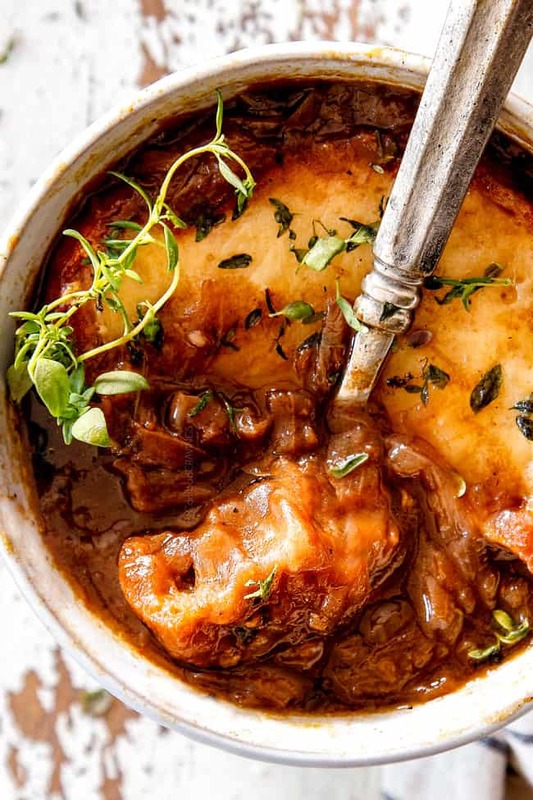 Classic French Onion Soup gets its name because it originated in France in the 18th century and it has been a national treasure – nay, worldly treasure – ever since. French Onion Soup is made with caramelized onions, beef broth, white wine, bay leaves and thyme, thus French + Onion + Soup! It is unclear when the cheesy bread crouton was added but it has become an iconic part of the soup. Where did French Onion Soup Come From? 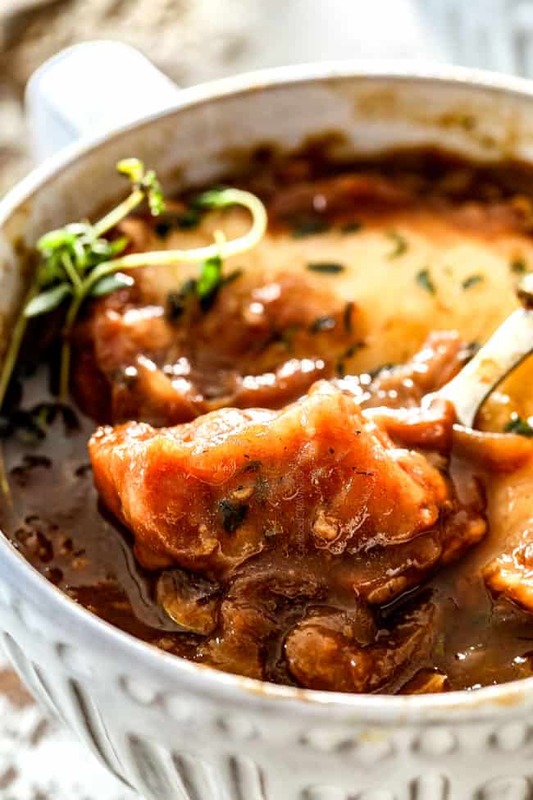 There are two competing legends about the origin of French Onion Soup. The first legend claims King Louis XV returned home from hunting to practically bare cupboards. All his cook could find were onions, butter, and champagne so they were thrown into a pot and French Onion Soup was born. The second legend claims Nicolas Appert (inventor of canning) prepared the soup at the hotel kitchen of La Pomme d’Or in Châlons-en-Champagne, when the Duke of Lorraine stopped in on his way to the Palace of Verailles. The duke was so spellbound by the soup that he left his chambers in his bathrobe to rush to the kitchen to learn the recipe for French Onion Soup so he could take it back to his court. Appert dedicates his French Onion Soup recipe in his 1831 cookbook to the duke. So, I’m kind of guessing that’s the real story. How long does it take to make French Onion Soup? Homemade French Onion Soup is a labor of love – or is it selfishness? Because I could selfishly eat the entire pot  ! Either way, you will LOVE the results! From start to finish, this French Onion Soup recipe takes about 90 minutes. 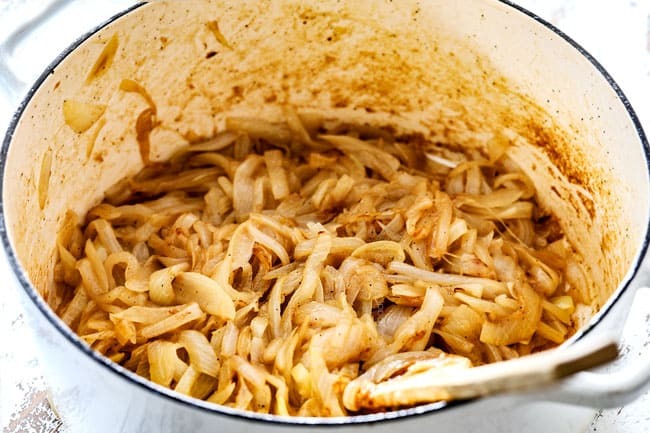 The lengthy cooking time has two phases: 1) slowly caramelizing the onions in butter for 45-55 minutes and 2) simmering the soup for 20 minutes with the caramelized onions, broth and seasonings so all the flavors can build and meld. 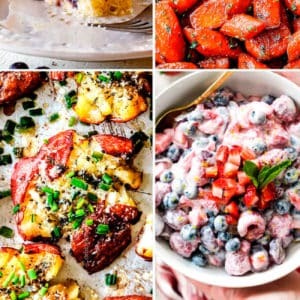 It is crucial that you don’t skimp on either of these phases, otherwise you are skimping on flavor and you will be able to taste the lackluster effort. After all, French Onion Soup is mostly onions and broth, so the steps need to be done right. So, if you plan on making French Onion Soup, it takes time and patience, but is worth every stirring minute. What kind of bread is used for French onion soup? French Onion Soup would just be onion soup if it wasn’t topped with a toasted baguette swaddled in melty cheese. For this pièce de résistance, I like to use crusty artisan bread because it is thick, chewy and holds up well when bathed in broth. A slice of artisan bread is also roughly the size of a bowl, so it fills the entire top with cheesy decadence. Instead of artisan bread, you can also use a hearty baguette. Since baguettes are thinner, you will likely need two or more slices to fill the surface of the bowl as opposed to one. Beef or Chicken Broth For French Onion Soup? Beef Broth is ideal for the best French Onion Soup. While some recipes use chicken broth or even vegetable broth, they do not have the same rich, depth of flavor that beef broth provides. It is important that you use a quality beef broth because this a huge component of the soup. Also, take care to use low sodium beef broth so your French Onion Soup isn’t too salty. You can always add salt, but you can’t take it away! What Store Bought Beef Broth is Best? 1) Rachel Ray Stock-In-A-Box All Natural Beef Flavored Stock: Tasters called it “steak-y” and “rich” with “thick body.” It starts with beef stock and a shorter list of ingredients than the number 2 rank for a more fresh, real meat and a really beefy flavor. 2) College Inn: relies more on beef derivatives which gives the stock flavor and body. I also really like Kitchen Basics and Trader Joes Organic Beef Broth. What’s your favorite brand? What is the traditional cheese for French onion soup? Gruyere Cheese is the traditional cheese used in classic French Onion Soup – for good reason. 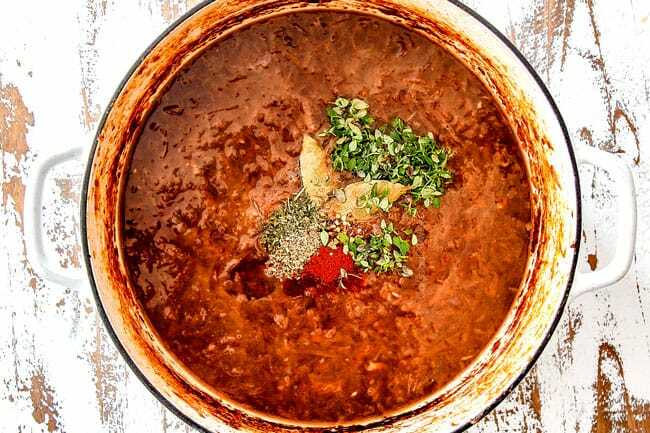 It creates the crowning blanket of gooiness that slips into the soup for irresistible cheesy slurpfuls. If you aren’t familiar with Guryere cheese, it is one of my absolute favorite cheeses as I effuse in my Gratin Potatoes recipe. 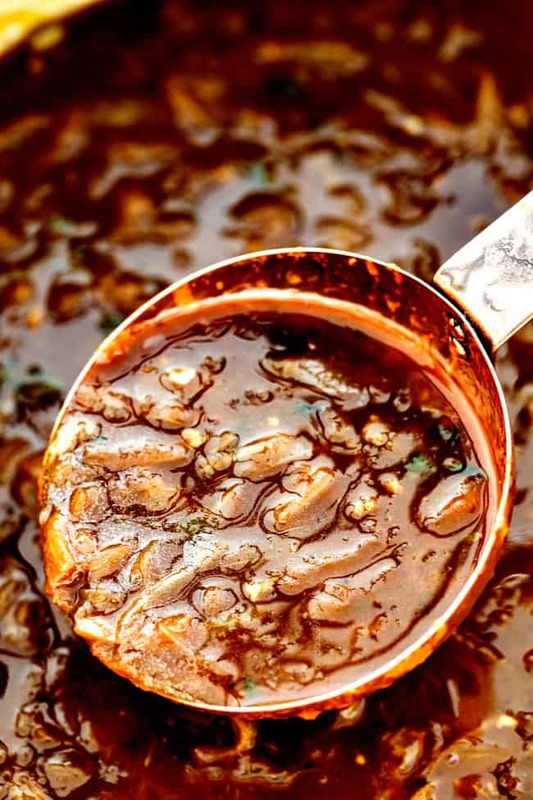 It is rich, smooth, and melts easily; is slightly salty, sweet, nutty AKA it belongs in French Onion Soup! Gruyere is traditionally located with the specialty cheeses in the deli section of your grocery store. If you have the option to purchase aged Gruyere, then go with that, as the flavors become more complex as the cheese matures. What If I Can’t Find Gruyere Cheese? I strongly recommend Gruyere cheese for the Best French Onion Soup recipe and I believe it’s worth the few extra dollars for its flavor and texture. 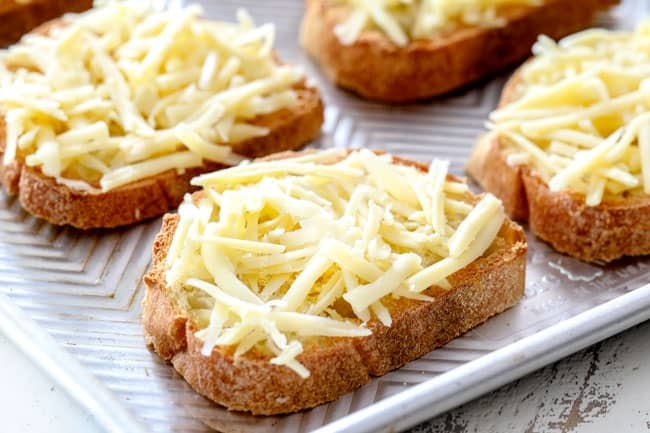 If you can’t find Gruyere or if its too expensive, then you can substitute it with Emmental, Jarlsberg or even a combination of mozzarella, provolone and/or Swiss. What are the best onions for French onion soup? Yellow onions are the best onions to use in French Onion Soup. They exude bright flavor and both mild bitterness and mild sweetness. 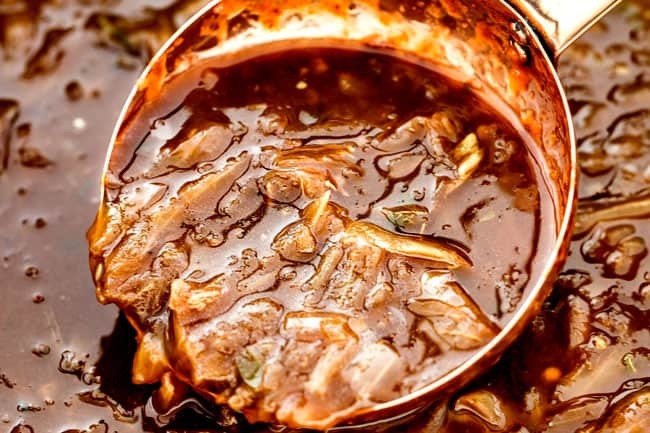 The sweetness is the perfect depth for French Onion Soup as it is exponentially enhanced when the onions are caramelized, whereas other onions can make the soup too sweet. Can you use red onions in French onion soup? You can swap one yellow onion for one red onion or swap one yellow onion for one white onion in this French Onion Soup recipe. I do not recommend more than one red onion or one white onion otherwise the soup will be too sweet. How Many Onions do I need for French Onion Soup recipe? 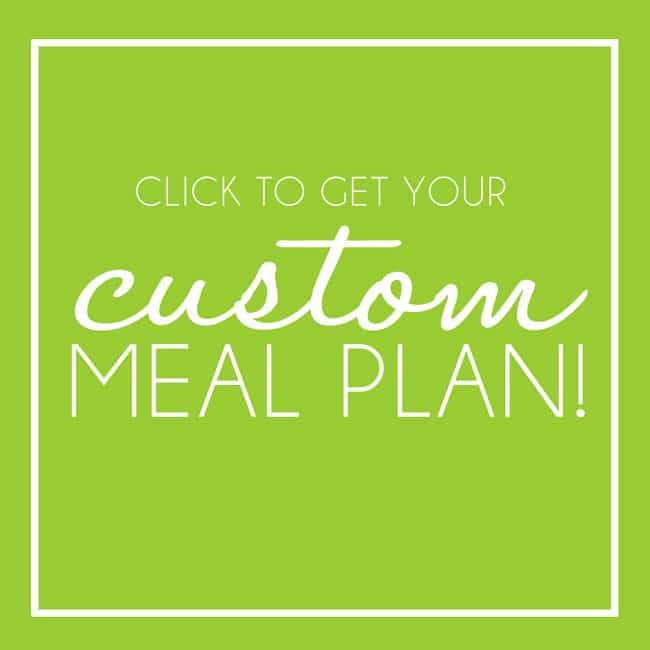 You will need 4 pounds of onions which is about 5-6 medium onions or 4 extra large onions. You don’t need the exact amount of onions as you can add more or less broth, but try and get pretty close. 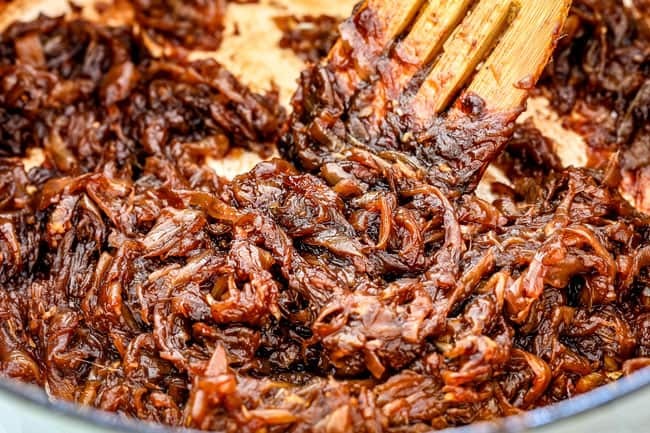 4 pounds may seem like a lot of onions, especially when the onions are sliced and contained in your pot but you will be AMAZED at how much they reduce in volume once caramelized – so don’t skimp! How do you cut onions for French onion soup? Cutting your garlic and onions is the only chopping required for this easy French Onions Soup recipe (winning!) and actually goes very quickly. 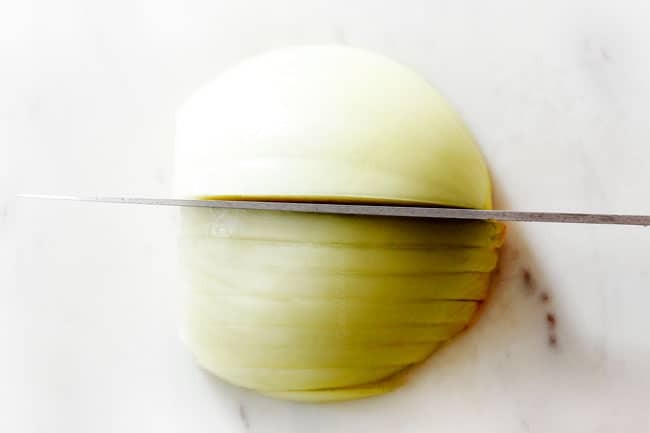 Using a sharp chef’s knife, trim off both root and stem ends of the onion. Slice onion in half through the root and stem and peel off the skin. Thinly slice onions lengthwise, from the root to the stem, into ¼” wide slices. This helps them hold their shape during cooking, whereas, crosswise cut onions tend to fall apart when cooked. Try and slice your onions roughly the same size so they cook evenly. Melt butter with olive oil in a Dutch oven or heavy bottom stock pot. Add the onions, brown sugar, salt and pepper. Increase heat to medium high and cook for 5 minutes, stirring often. 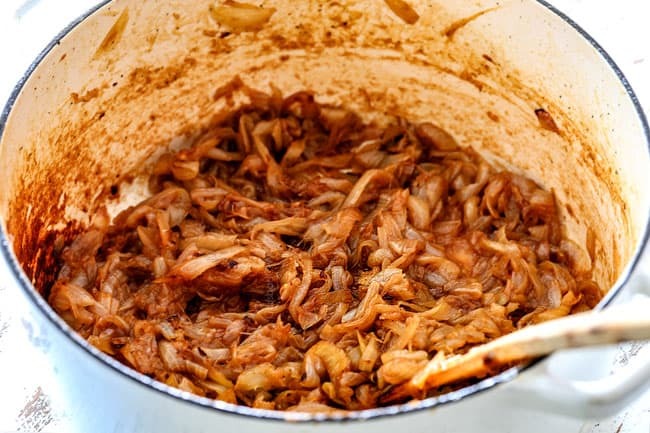 Reduce heat to medium and cook onions, stirring frequently (especially towards the end so they don’t burn), scraping the bottom and sides of the pan, until they are deeply browned, 40-50 minutes. These photos are taken at 5 minutes, 15 minutes, 30 minutes and 45 minutes. More tips on How to Caramelize Onions below. Add garlic and cook for 30 seconds over medium heat. Add water, balsamic vinegar, soy sauce and Worcestershire sauce and stir to scrape up any browned bits on the bottom of the pan. Cook until liquid is absorbed. Sprinkle flour over onions and cook while stirring for 2 minutes. Add the beef broth, bay leaves, thyme, 1/4 teaspoon salt, 1/4 teaspoon pepper and all seasonings. Bring soup to a boil then reduce to a gentle simmer. Simmer uncovered on LOW for 20 minutes, stirring occasionally. 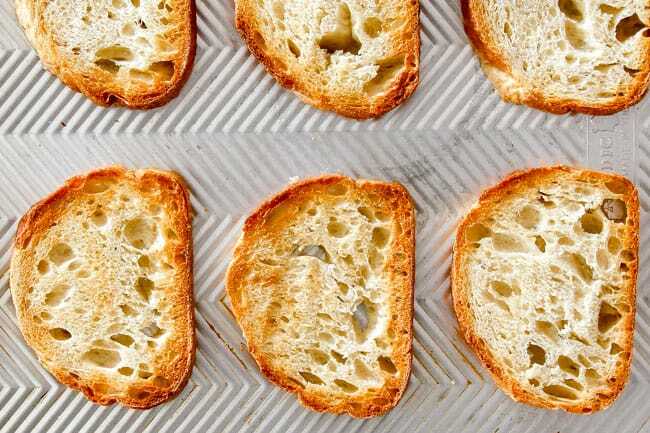 When ready to eat, toast bread by spreading slices in an even layer on a baking sheet. Broil on the middle rack of the oven until golden, 5-7 minutes. Flip over and broil another 3 minutes or until golden. Sprinkle bread with Gruyere and broil on the middle rack until cheese melts, 3-5 minutes. Don’t go for super golden or the cheese won’t be as gooey. 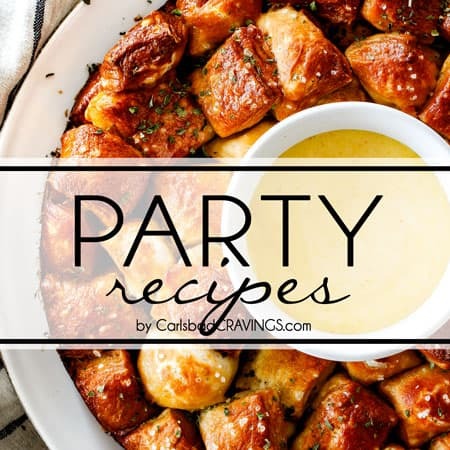 Top with 1-2 cheesy crouton slices (depending on if you used a loaf or baguette). There are a lot of French Onion Soup recipes out there. Some use a few of the below suggestions, but when you find them all in one place, you get the Best French Onion Soup! Quality beef broth: Your soup is only as good as your broth, so splurge a little or use homemade. 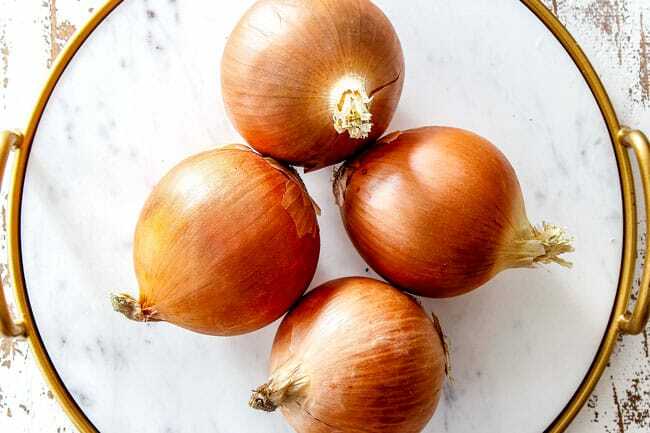 Yellow onions: Provide the best balanced flavor for French Onion Soup – savory and pungent yet mildly sweet when caramelized. 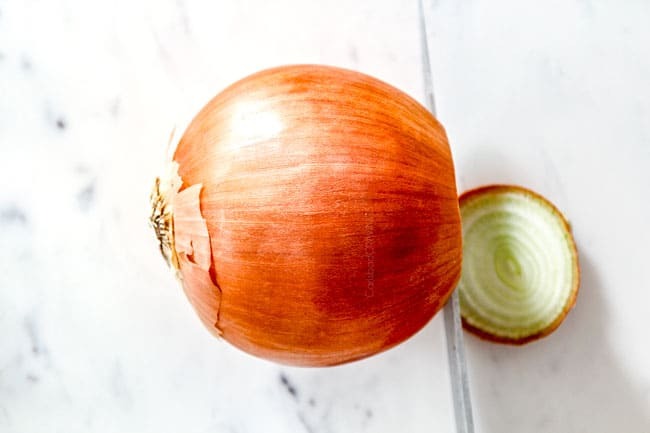 More onions: We use 4 pounds of onions as opposed to commonly used 3 as the onions shrink a TON when cooked and after all, they are the star of the French Onion Soup! Butter and olive oil: Both the butter and olive oil infuse the onions with flavor and the olive oil prevents the butter from burning over the long caramelization process. 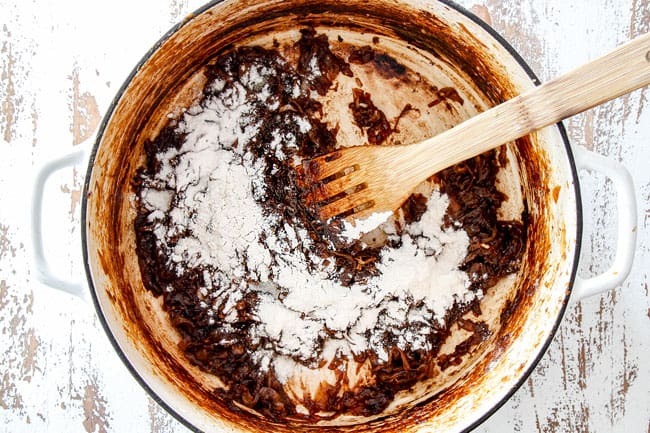 Sugar: Just ½ teaspoon sugar accelerates the caramelization process and develops deeper flavor. High heat: Cooking the onions for 5 minutes at medium-high heat promotes quicker browning and shortens the caramelization time. 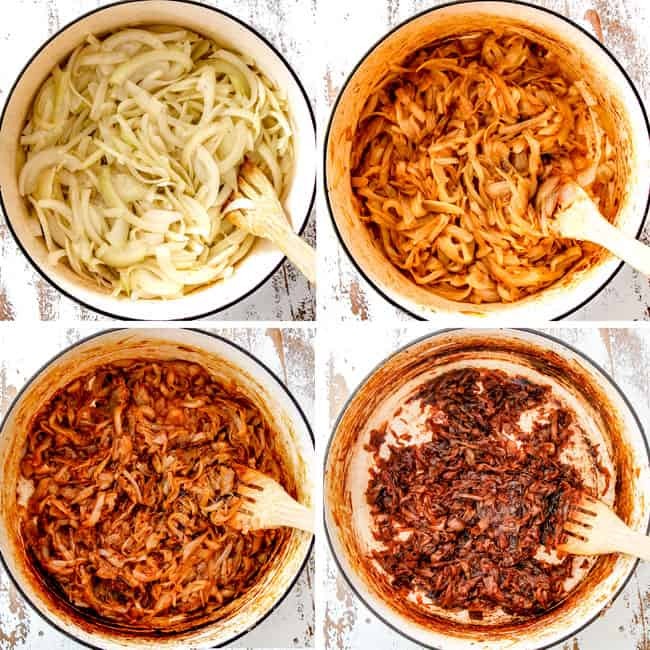 Don’t rush the onions: If you think your onions are caramelized but not sure, cook on! The last 10 minutes of caramelization is crucial for intensely sweet onions. They should be quite dark golden. More tips on How to Caramelize Onions below. Use flour: Just 2 tablespoons of flour transforms our broth from watery to delightfully rich while still remaining silky. Seasonings: French Onion Soup is traditionally seasoned with thyme and bay leaves but I’ve also added dashes of parsley, oregano, paprika and red pepper flakes for subtle layers of flavor. Deglaze: Deglazing the pan with soy sauce, balsamic vinegar and Worcestershire sauce not only utilizes the caramelized flavorful bits in the pan but infuses the onions with tons of complex flavors. Toast bread: Toasting the bread before adding it to French Onion Soup is key to a cheesy crouton instead of a soggy, mushy piece of bread. Gruyere: Melts beautifully to create the ultimate bubbly crust when broiled. 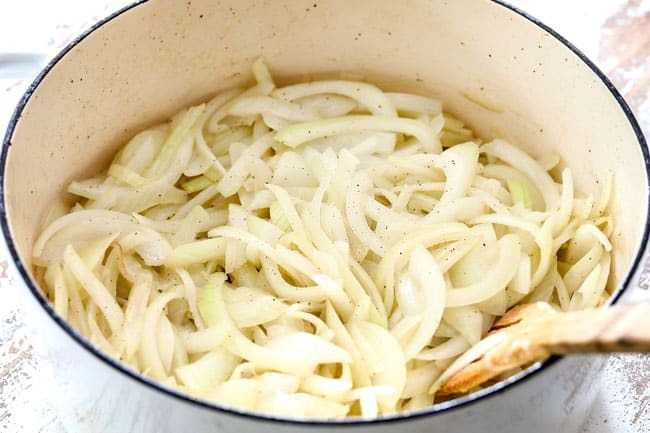 Caramelizing onions is a breathtaking transformation of a humble, sharp, crisp vegetable into a soft, luxuriously sweet, complex delicacy worthy of its very own soup! Caramelizing onions is a chemical process in which their sugars break down over medium-low heat. Caramelizing the onions does take time, but is very easy and completely worth the effort. How do you caramelize onions for French onion soup? Cut onions uniform: Try and slice your onions into uniform slices so they cook evenly. 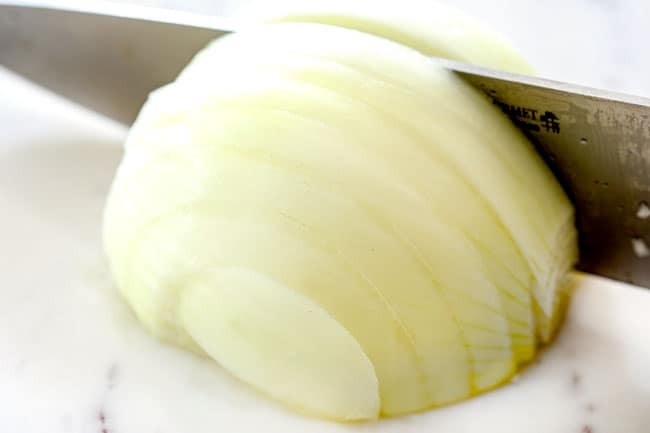 Don’t slice onions too thin: Keep your onion slices about ¼” thick, erroring on the side of thicker. They might seem thick but will cook down considerably. Onions that are too thin will end up stringy and mushy – we don’t want that! 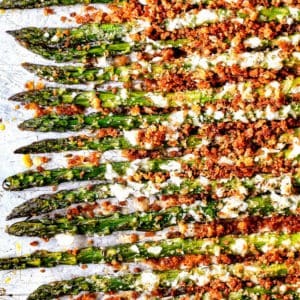 Generous butter and olive oil: Don’t skimp on the butter! Not only does it add flavor but it keeps the onions from sticking and scorching while cooking. The olive oil will keep the butter from burning a well as add flavor. 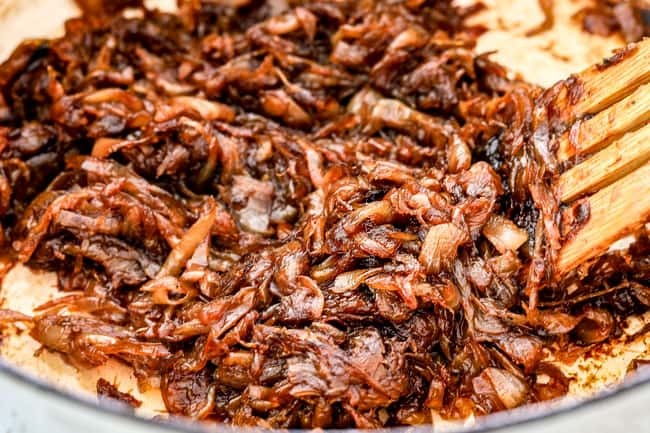 Cook over medium heat: Cook the onions over medium heat until deeply caramelized, reducing the heat if the onions start sticking to the pan or scorching. 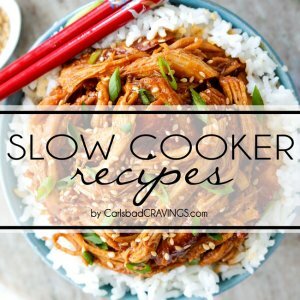 We want them to cook slow as the flavor comes from golden caramelization and not burning. Caramelized Onions 15 minutes later (after 20 minutes total). 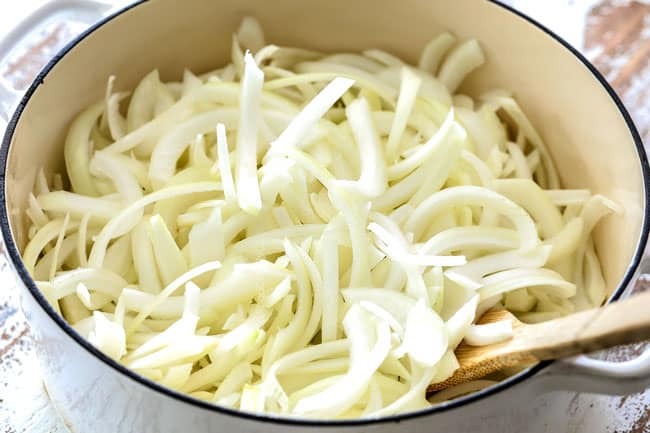 Stir: You don’t need to stir your onions constantly, but you do need to stir them every few minutes to ensure they are cooking evenly. You will want to stir them more often when they are reduced and mostly caramelized because then they have a stronger chance of burning. Caramelized Onions 15 minutes later (after 35 minutes total). Caramelize more: when your onions look caramelized, go for more My onions looked pretty caramelized at about 30 minutes, but I reduced the heat to low and continued to cook and stir for another 10 minutes and the results were breathtaking because the deeper the color, the deeper the flavor! Caramelized Onions 15 minutes later (after 50 minutes total). Do I Need Oven safe Bowls for French Onion Soup? No! If you’ve been waiting to make homemade French Onion Soup because you thought you needed special bowls, think again! Easy French Onion Soup can be served in traditional bowls – whatever you have already! 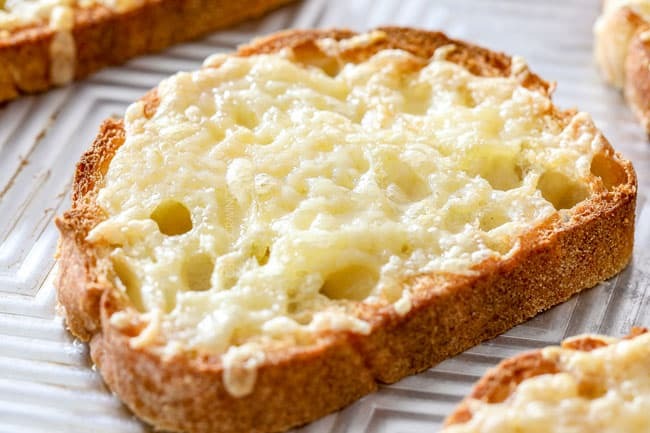 Instead of melting the cheese over the bread in a bowl, the cheese is melted over the bread on a baking sheet for equally delicious, if not better results. By melting the cheese on a baking sheet, the bread doesn’t have to sit in the soup for as long before it gets to you mouth. 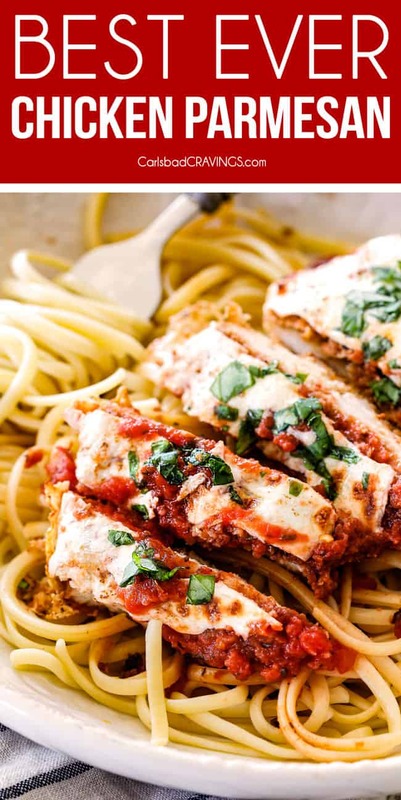 This means less soggy bread and more cheesy crouton action. Is French onion soup healthy? 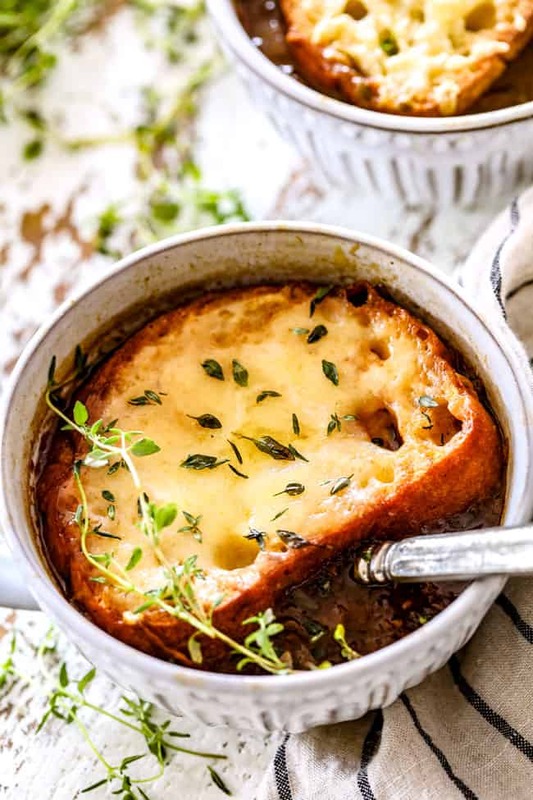 French Onion Soup is relatively healthy with its brothy base as opposed to a creamy one but becomes more indulgent when the cheesy crouton is added. But it’s worth every bite. Can I Make French Onion Soup Ahead? Yes! French Onion Soup tastes even better if made a day or 2 in advance, so I highly encourage you to make it ahead of time! To make French Onion Soup ahead of time, follow the recipe as directed up to the point of completing the soup but not adding the cheesy croutons. Add soup to oven proof bowls or an airtight container and store in the refrigerator for up to 4 days. 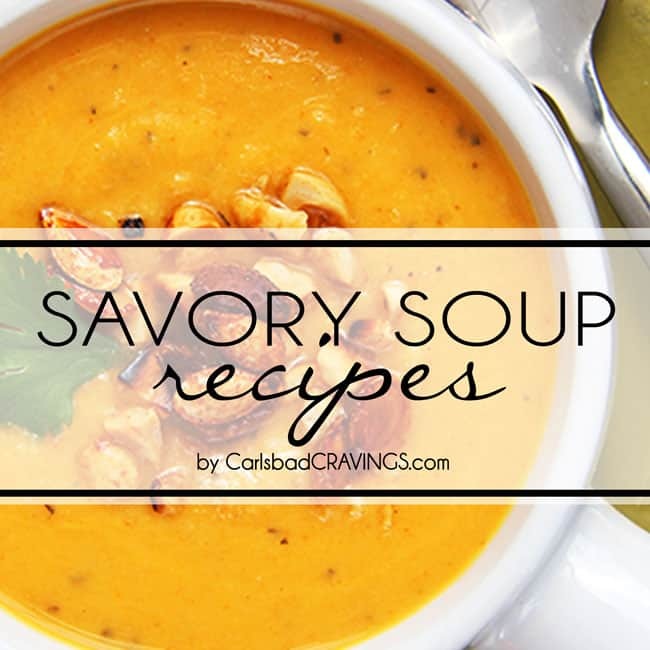 Warm soup on the stove and proceed with recipe instructions. When ready to serve, preheat the oven to 350 degrees. Transfer bowls straight from the refrigerator into the preheated oven. Reheat the French Onion Soup for 20 minutes then remove from the oven. Turn oven from bake to broil. Toast bread as instructed per recipe instructions. Top soup with a slice of bread then grated cheese. Return to oven on the middle rack and broil 3-5 minutes or until cheese is melted. Can French onion soup be frozen? Add Soup to freezer safe containers or freezer size bags. When ready to eat, let soup defrost in the refrigerator overnight. Warm individual servings in the microwave or warm on the stove until heated through. Want to try this French Onion Soup Recipe? 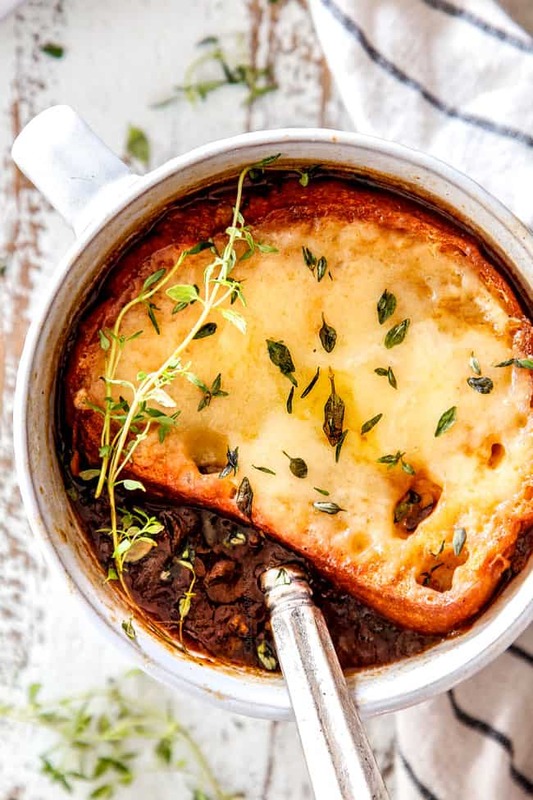 French Onion Soup is easier than you think to make at home so you can cuddle up with a big bowl of hot, herby beef broth loaded with deeply flavorful caramelized onions and ooey gooey Gruyere croutons any night of the week! In the post, I’ve included detailed instructions, tips for perfect caramelized onions, how to make French Onion Soup without oven safe bowls, how to make ahead and how to freeze! Reduce heat to medium and cook onions, stirring frequently (especially towards the end so they don’t burn), scraping the bottom and sides of the pan, until they are deeply browned, 40-50 minutes. Turn heat down if the onions scorch or stick to the pan (I turn heat down the last 15 minutes). Add the beef broth, bay leaves, thyme, ¼ teaspoon salt, ¼ teaspoon pepper and all seasonings. When ready to eat, toast bread by spreading slices in an even layer on a baking sheet. Broil on the middle rack of the oven until golden, 5-7 minutes. Flip over and broil another 3 minutes or until golden. Sprinkle bread with Gruyere and broil on the middle rack until cheese melts, 3-5 minutes. Ladle soup into bowls and top with 1-2 cheesy crouton slices (depending on if you used a loaf or baguette). Alternative method for OVEN SAFE bowls: Ladle soup into bowls, top with a slice of bread then cheese. Place bowls in the oven on the middle rack and broil 3-5 minutes or until cheese is melted. Don’t slice onions too thin: Keep your onion slices about ¼” thick, erroring on the side of thicker. They might seem thick but will cook down considerably. Onions that are too thin will end up get stringy and mushy – we don’t want that! What Beef Broth is Best? Rachel Ray Stock-In-A-Box All Natural Beef Flavored Stock: Tasters called it “steak-y” and “rich” with “thick body.” It starts with beef stock and a shorter list of ingredients than the number 2 rank for a more fresh, real meat and a really beefy flavor. College Inn: relies more on beef derivatives which gives the stock flavor and body. I also really like Kitchen Basics and Trader Joes Organic Beef Broth. What's your favorite brand? French Onion Soup tastes even better if made a day or 2 in advance, so I highly encourage you to make it ahead of time! 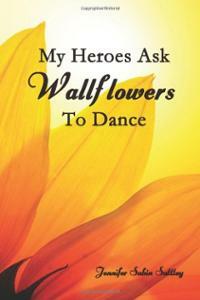 Thank you so much for your thoughtful comment Mitzi! 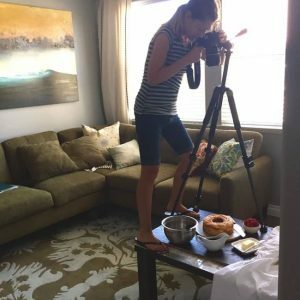 I’m so honored you enjoy my website and never have to swap ingredients – it sounds like you have fabulous taste ;). 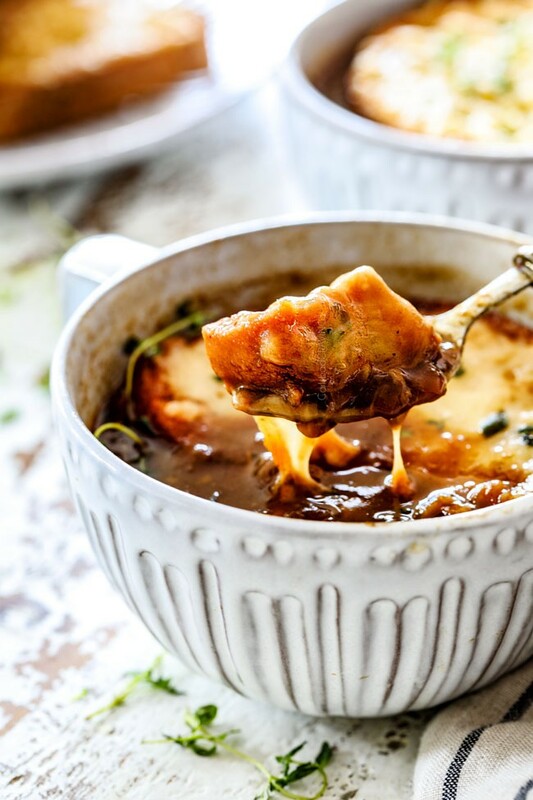 Thanks for taking the time to comment and for making my recipes – I hope this French Onion Soup is another favorite! Jen I just went grocery shopping at our grocery store and bought a new onion called ” tearless sweet onions” and I bought some to make this soup. I couldn’t believe my eyes when I saw the name. Can’t wait to try them with this recipe. 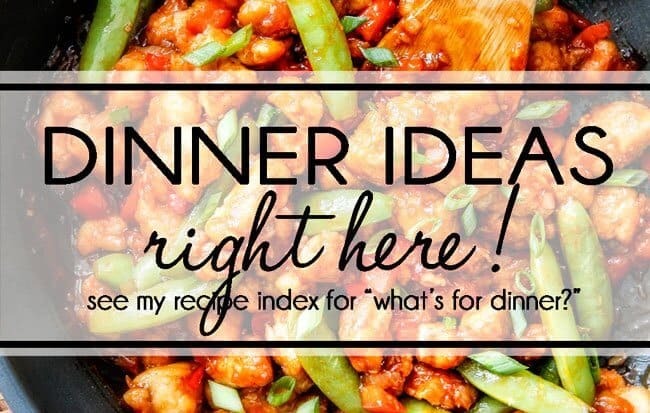 As always, thank you for the informational recipes!!!! Tearless onions?! my dreams come true! I can’t wait to hear if they work!!!! This looks amazing!! 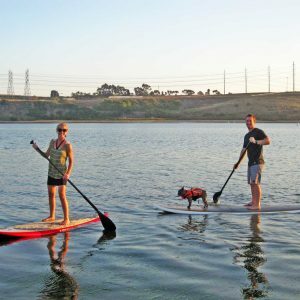 Do you have a brand of beef broth that you recommend for this? 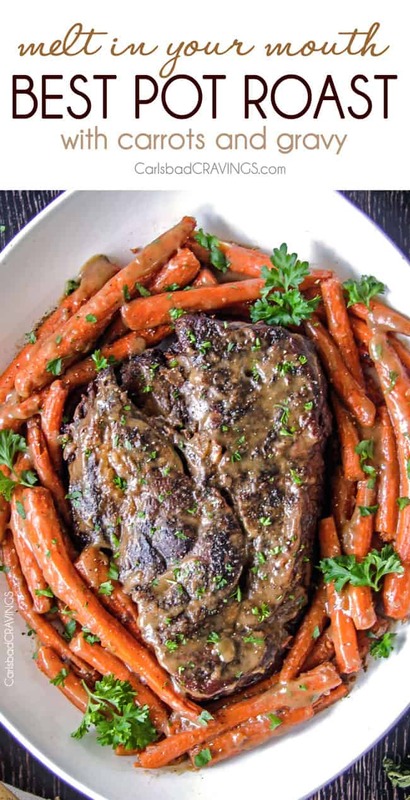 Cook’s Illustrated did a study on the best supermarket beef broths and testers ranked 1) Rachel Ray Stock-In-A-Box All Natural Beef Flavored Stock and 2) College Inn. I also really like Kitchen Basics and Trader Joes Organic Beef Broth. I hope that helps! 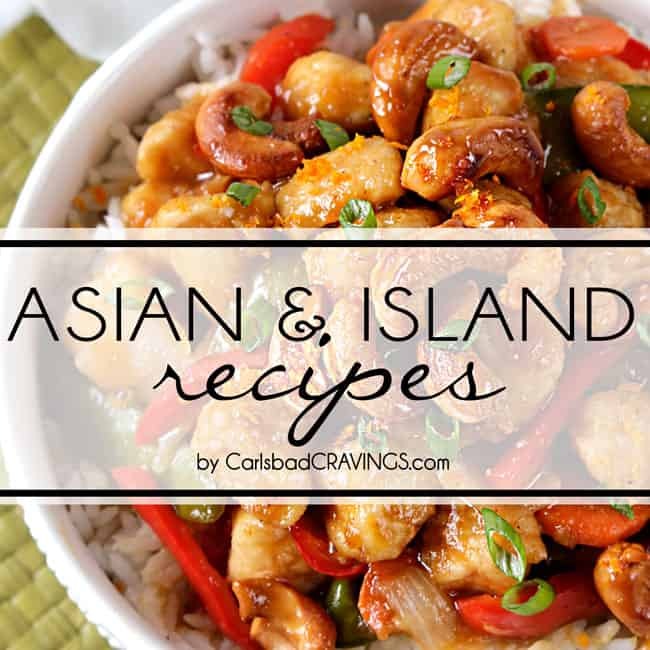 Hi – I tried to make this last night and cooked those onions for more than an hour without them ever caramelizing. At about 45 minutes I tried moving half of them into another pan to see if it was just overcrowding, but I went for 30 minutes longer and never got that dark, rich color. Since I already have the bread and cheese, I’d like to try again tonight. Any troubleshooting advice? Thanks! Hi Jacki, I’m sorry you had that problem! 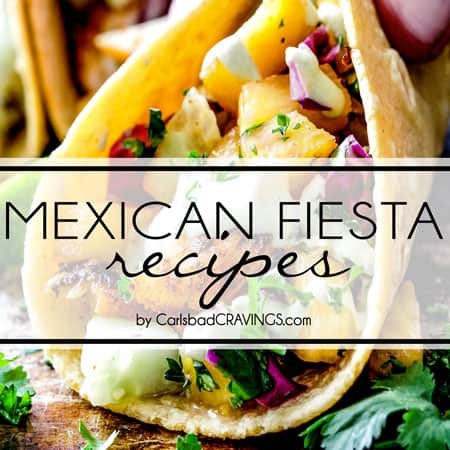 The may not caramelize in an hour if the pan is too small so they are just steaming or if you aren’t using a heavy bottom pan like a Dutch oven which keeps in the heat. You also may need cook your onions over a higher temperature. I hope that helps!